When someone first sees your home, nine times out of ten, the first thing he or she sees is your driveway gate. As anyone knows, first impressions are incredibly important, and you only get the chance to make them once. That’s why you should put a lot of work and attention into making your driveway look amazing, and that includes a fully-functional, modern, aesthetically pleasing gate system. Here are some tips to bring your driveway to the next level. You definitely want an automatic gate. 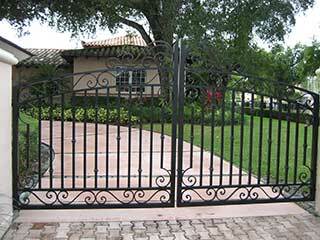 Almost all modern residential gate installations include electric openers. It can be a drag to have to manually move the mechanism every time you want to get your car in or out of the driveway. This can be even worse if it’s raining, snowing, or when you're stressed for time. Once you’ve got an automatic system set in place, you’ll be able to choose from several options of how you want people to be able to get in. An intercom installation is a popular choice. This lets you talk to the person who’s requesting entry and to "buzz" them in from the comfort of your home, or from anywhere else, with some models that utilize wireless communication. For the more security-minded, there’s a multicode remote. Instead of a “clicker” that anyone can get their hands on, one must know a person-specific code in order to be able to get passed your gate. There are several options to choose from here. You want people to be blown away when they get the first glimpse of your new gate. The visual style of a two-plane gate that swings open down the middle is hard to beat; the alternative is a unit mounted on wheels, which can be more sturdy, but looks too heavy and overbearing for many homeowners' taste. Although, it will allow you to avoid costly hinge welding repair that swing gates can require. There are other factors to consider as well, such as the material. Wood is the most customizable option, but it’s can also be very expensive and tends to require frequent maintenance. There is the wrought iron option, which offers durability and luxurious appeal, especially when it is coated with a gold trim. Of course, it can develop rust and will require frequent maintenance as well. Then there's steel, which can provide extra privacy when it is built in the form of complete panels as opposed to bars. Of course, that would make it heavier, which means the opener will need to be powerful enough to move it. Aluminum is very lightweight but can dent more easily, and therefore provides less security. No need for you to decide without getting all the facts first. That's what our team at Gate Repair Thousand Oaks is here for. Feel free to get in touch with us in order to consult with our experts on the different custom-made gate options available to you today.